Virginia Tech: Make Sure It Doesn’t Get Out deals with massacre at Virginia Tech and those who exploited the shootings for their own ideological and personal reasons. 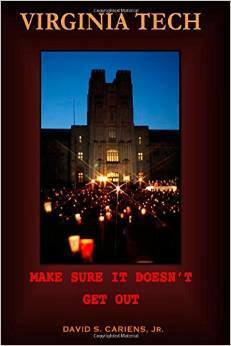 Along with a detailed analysis of the timeline of events, this book examines the motivations and character of the shooter, the lives and hopes of the victims, and the missed opportunities by government and school officials to do something significant to improve campus security and help prevent future school shootings in the wake of the events on April 16, 2007. David Cariens discusses his reasons and motives for writing, the problems the victims’ families have faced and continue to face in their efforts to find the truth, as well as the misconceptions about what actually happened before, during and after the Tech massacre. The book contains a detailed analysis of the Governor’s Review Panel Report and looks at what parents can do to help ensure the safety of their children on our school grounds. Mr. Cariens draws on over 47 years of work in intelligence and crime analysis, over ten years of research and writing on school shootings in Virginia, numerous scholarly works on school safety, personal interviews with victims and their families, and a plethora of news accounts and reactions to the shootings at Virginia Tech. Finally, he brings to the book his personal experience in having lost a family member in a Virginia school shooting. This book is a clarion call for action to stop this nation’s all to frequent school violence. About the Author: David served in the CIA for 31 years before retiring in 1997. During his career he was a political analyst for 22 years in the Directorate of Intelligence, specializing in Balkan affairs. In this capacity he produced finished intelligence for all levels of the U.S. government, from the President to working level counterparts throughout the Community. He has designed intelligence analysis/writing courses and taught them throughout the Intelligence Community. He has given writing workshops at the International Association of Law Enforcement Intelligence Analysts (IALEIA) in Alexandria in 2005, in Mexico City in 2006, in Vancouver, Canada in April, 2007, and in Boston in 2008. David presented a similar writing workshop at the Law Enforcement Intelligence Unit’s national meeting in Tempe, Arizona in June 2006. He has conducted intelligence analysis training for the Criminal Intelligence Service of Canada and for the Canadian police. Paul B. Stimson will be joining David Cariens at this book signing! in 16 days and 23:34 hours.